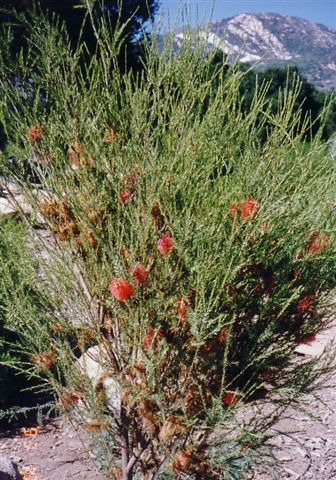 Medium shrub with fine green leaves and orange-red flowers appearing in spring/summer. Prefers full sun and well drained soils for optimum growth. Recommend pruning when young for compact growth and maintain tip pruning throughout the year. Flowers on old wood, so hard pruning not recommended. Tolerant of moderate frosts and extended dry periods but will appreciate summer watering in California. Attracts hummingbirds.